It’s a fend for yourself night at the house. Yeah!! I decided to use this opportunity to make a meal that I have been craving for weeks now. You already know me, but it has to involve peppers. Your surprised aren’t you? 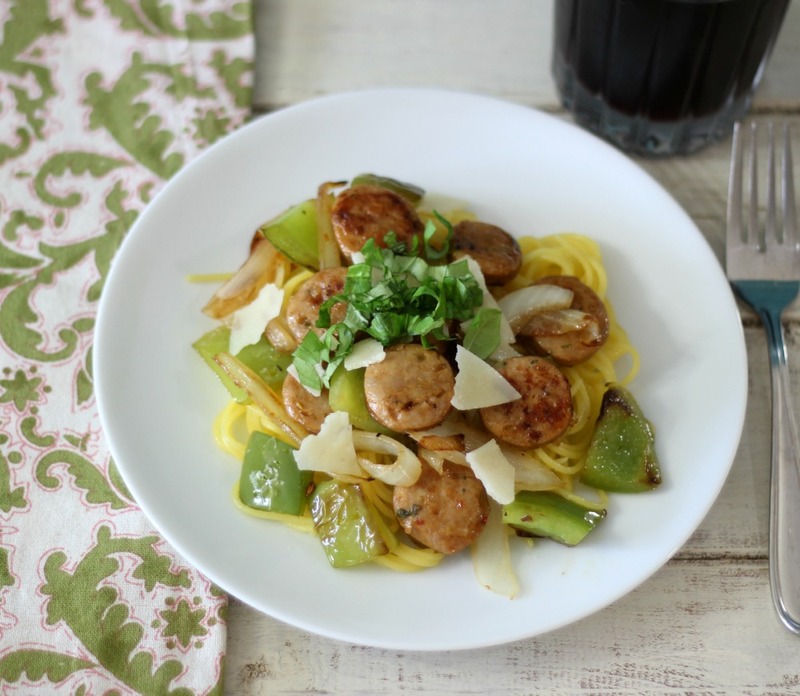 It’s a healthier version of Italian Sausage and Peppers Pasta. Yum! Plus as bonus it is made in under 30 minutes. Perfect for a weeknight dinner. This dish is spicy, filling and so darn good. It’s like Italian Sausage with Peppers and Onions sandwich without the bread, but pasta instead. I actually only made it using 2oz. of pasta and when I looked at the plate, I thought, boy this isn’t going to be enough, but you know what? It was and it was so filling. This meal will be making my dinner rotations. 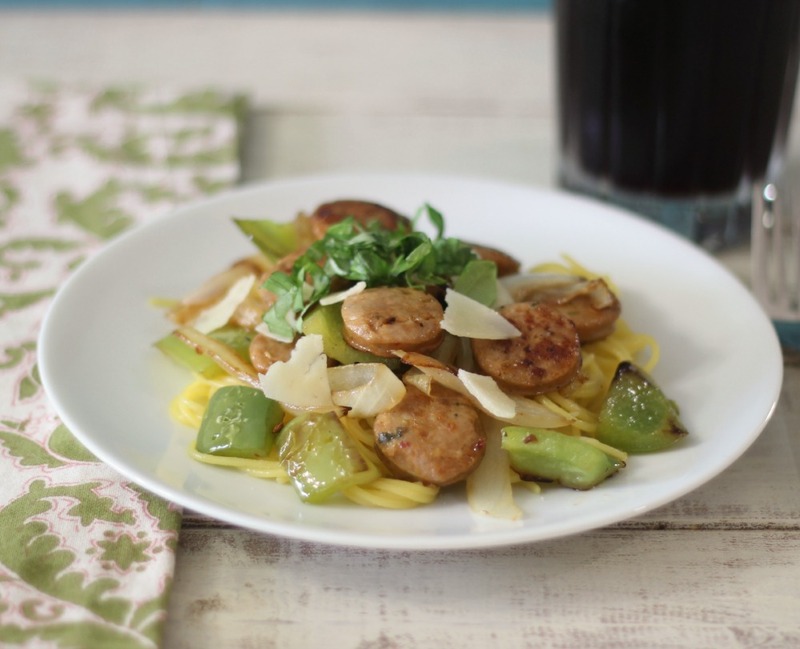 To lightened up this dish and to make it healthier I used quinoa pasta, which I just love, Spicy Chicken Sausage and just some olive oil for additional flavor. I decided to use Spicy Italian Chicken Sausage that I picked up from Trader Joe’s because it is only 140 calories a link. 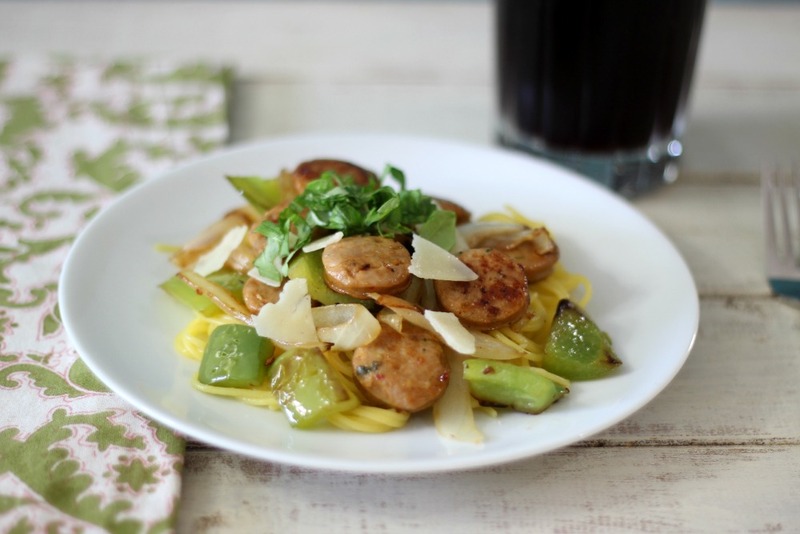 Normal Italian Sausage is around 300 calories, if not more. The chicken sausage is half in calories an I have to admit the chicken sausage really did taste like Italian Sausage to me. I think if my family would have had it, they would have to agree. So with all these little changes, I think I saved my self well over 300 calories on this dish, not too shabby. A reduced calorie, spicy, filling pasta dish that is made with quinoa pasta, spicy chicken sausage and peppers and onions, tossed in olive oil and topped with basil and parmesan cheese. In a large pot bring about 6 cups of water to a boil, add pasta and cook until tender, about 10 minutes. Drain Pasta. Meanwhile in a large skillet, add ½ tbsp. 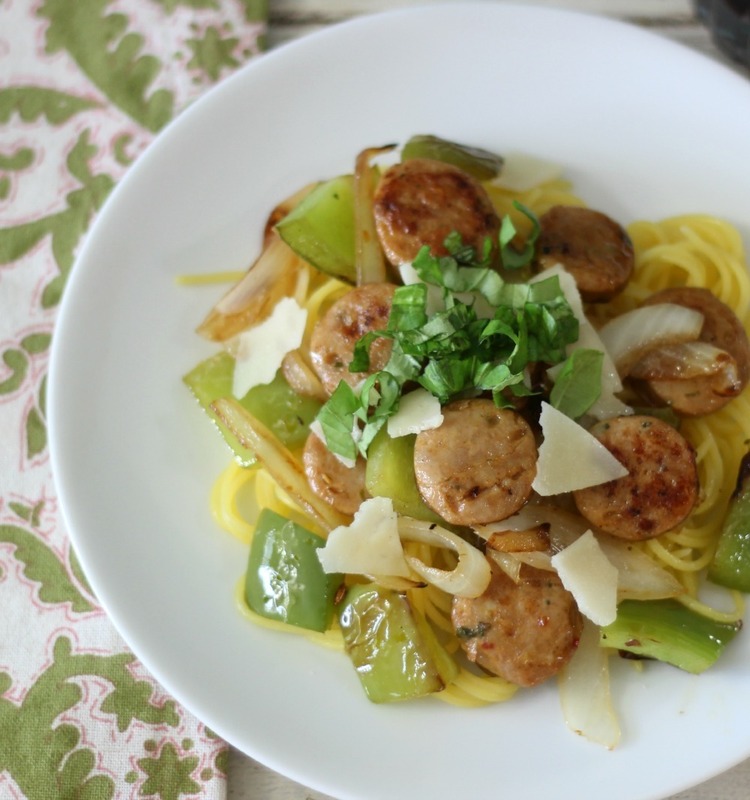 olive oil, bell pepper, onions and sausage. Cook until vegetables are tender and sausage is cooked, about 10 minutes. 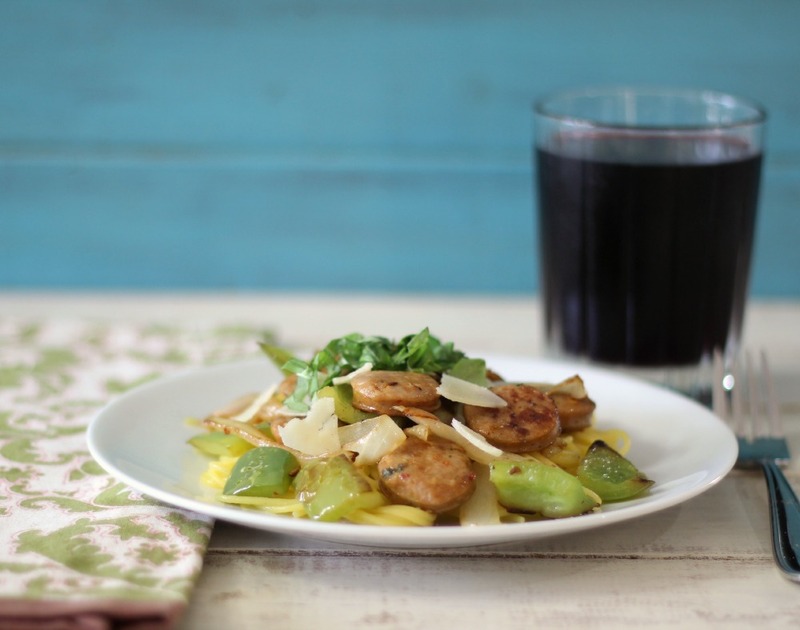 Toss cooked pasta and 1 tbsp, olive oil into skillet with vegetables and sausage. Mix together until well combined. Serve immediately. Top with basil and Parmesan cheese if desired. I love my fend for yourself nights and it seems like it has been a while since I have had one. Now that I made my 30 minute meal, I think I am going to make some cookies, since I have time. Double bonus for my co-workers. This pasta is to die for! Love it! And I love that its lightened up! Is that 2 ounces of pasta before or after it’s cooked? I need to know how much to measure before I put it in the water. I love what you did to lighten up the recipe Jennifer!